I REALLY didn't want scrambled eggs. Scrambled is probably my least favorite way to have eggs. I will eat them scrambled, but given a choice would fix them pretty much any other way. What I REALLY wanted was hard boiled eggs. So I set about boiling up a half dozen. Putting them in the pot, I dropped one. It only dropped to the counter, but it cracked the shell. Now it couldn't be boiled and I had wasted an egg. You see, my mindset was such that since it couldn't be used as I had planned, it was ruined and I almost threw it away. WAIT. It was still a perfectly good egg as long as I used it right away. 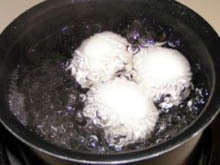 The cracked egg was not wasted, and I still had plenty to boil up the half dozen I wanted. 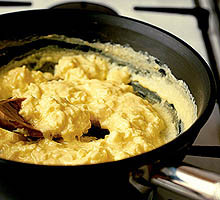 So I decided to add another to it, and make some scrambled eggs while I waited for the water to boil. Those of you who have read this column before know it is usually about attitude and outlook. Sometimes the unexpected happens and changes our plans. We can make the best of it, or let it ruin our day. The old saying about life handing you a lemon and making lemonade, comes to mind. I once heard someone say, "I had a rotten day today. No, I really didn't. I had a rotten 15 minutes this morning, but I milked it all day". Realization is half the battle won. This episode with the eggs made me realize or remember a few things. Crying over spilled milk (or a broken egg) won't bring back the milk and won't get the mess cleaned up. Often what at first seems to be a waste doesn't have to be a complete loss. The scrambled eggs really were pretty good after all. Oh, yes, one more thing. 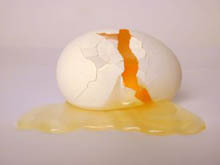 When I dropped the egg, it never broke the yoke. 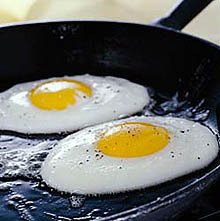 If my attitude had been different, I might have realized sooner; I could have had them fried.